Glaucoma is a condition characterized by excessive pressure in the eye, or intraocular pressure. This irregularly high pressure is due to a buildup of fluid in the eye. As intraocular pressure increases, it can compress the eye’s optic nerve, eventually leading to vision loss. Around 3 million people in the United States have glaucoma; although only half are aware of it. 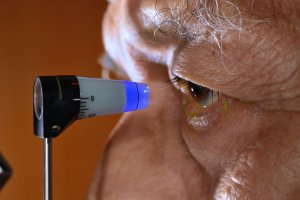 For people over 60 years old, glaucoma is a leading cause of blindness. The loss of vision is often so gradual that by the time you notice any difference in your vision, the glaucoma is already at an advanced stage. Being older than 60 increases the risk of glaucoma in general; people who are over 40 years old may have an increased risk of acute angle-closure glaucoma. The most effective way to limit damage to your vision caused by glaucoma is with early diagnosis and treatment. This means having regular eye examinations that include measuring your intraocular pressure. The American Academy of Ophthalmology recommends that people have a comprehensive eye exam at age 40. If you have no risk factors for glaucoma, you should have an exam every three to five years after that. If you are over age 60 or have other risk factors, you should have your eyes checked every one to two years. Ethnic groups with a greater risk of glaucoma may need to have an eye exam earlier. If you experience gradual changes in vision, contact your eye doctor for an exam. If your vision changes suddenly, or if you have any other symptoms of acute angle-closure glaucoma, seek immediate care with an eye doctor or at the emergency room. Again, if left untreated, glaucoma can lead to blindness.